1. The keys to successful training are consistency and repetition . 2. There is a correction zone and a safe zone: the correction zone being the outer portions of the yard beyond the flags and the safe zone being the area inside the flags. The flags are strategically placed where the audible tone begins, and the audible tone rings before the correction to warn the pet it must move backward. 3. Each day of training requires no more than ten minutes of your time as dogs have short attention spans. 4. A single command should be utilized in the training process so as to avoid confusion. We prefer “careful” because it is not easily confused with or does not rhyme with other words and commands your pet may understand. 5. The command is to warn the pet of his proximity to the correction zone, the area past the flags. This is how the flags serve as a training mechanism. 6. The audible tone will sound when the receiver/collar is within range (the most widely used collar is 2.3 ounces, a negligible weight). This should tip you off during training to pull back on the leash and direct the pet out of the correction zone. Given the importance of the audible tone, if neighbors are mowing the lawn, or if an air-conditioning unit is humming loudly, move to a different portion of the yard so that you will hear the audible tone (yes, you as well as the dog can hear the tone—it is a rapid beeping well within the range of human hearing). 7. Your pet will not initially make the connection between the tone and the flags; thereby, he or she will not connect the flags with the correction that follows the audible tone. The idea is for the pet to associate the correction with the perimeter—not the collar and not the flags, but the perimeter. In short, the goal is to instill in your pet an association between the correction and the perimeter as opposed to an association between the collar and the perimeter. 8. The flags are at your pet's eye level to consistently and repetitively remind him or her of the system. 9. The leash is central to the process as it enables you, the owner, to pull the dog back (not to the side and not forward, but BACK) into safety and praise him or her for a job well done. 10. The motion with the leash is simple: The pet will approach the flags curiously at first. Talk to him or her using the "careful" command. As the pet nears the flags, pull back on the leash and firmly ask him to "sit" and "stay" while you praise him. Treats can be useful here, but kindness is the essential ingredient. 11. The yard should be divided into seven portions, and only one portion should be covered per day, moving to every other flag with the "careful", "sit", "stay", and praise technique. 12. It is wise to train twice at the driveway, as flags cannot be placed on the width of the drive. 13. It is important that during the training period the dog is not allowed to roam free. He or she must from the first day of training begin to reckon the flags as the marker of the new perimeter (except for walks and special events following the training period). 14. After one week of training on the leash using for the first day or two a disabled collar (INITIALLY USING A DISABLED COLLAR SERVES TO AVOID THE ASSOCIATION BETWEEN COLLAR AND CORRECTION) 1 , your pet will most likely be ready to train off the leash though there is no hurry. If you feel the slightest bit reluctant that your pet is not prepared, continue training on the leash. You should not feel rushed through the training process. 15. The collar fit is critical. You want the collar snug but not too tight, and longhaired dogs should have a trimmed patch for the receiver to rest comfortably against the skin. Following the training period, it is essential to check the fit of the collar, as the nylon will stretch slightly. A slight adjustment should be made. 16. The flags eventually need to be removed, so two weeks following the last training, remove every other flag every other day. This gradual removal is to avoid abrupt and noticeable changes that may affect the pet's response to the system. 17. Do not lift all the flags at once. This will give your vet the impression that the system has been removed miraculously, and this is counterproductive. 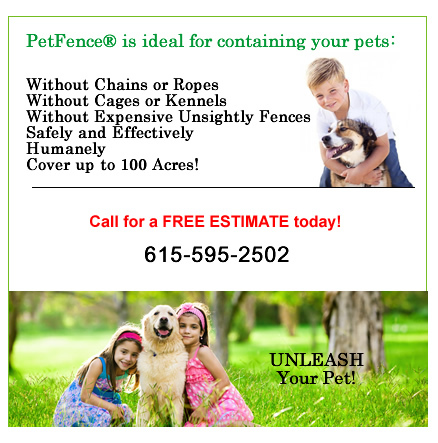 The ultimate goal is to train the dog so well that he or she appreciates the rewards of having free reign in a yard and the rewards that come from their obedience. 18. Later, batteries need changing in the receiver. These batteries can be purchased through me at a minimal cost. They can also be purchased online or at a number of stores around Middle Tennessee for your convenience. It is important to check the batteries every month. Often, pets learn when the batteries are low and exploit that weakness. Be smarter than your pet. Check the batteries monthly using the battery tester we provide and give the day of installation. The testing takes no more than one minute. 19. A wire repair kit is left next to your transmitter so that you may repair the wire yourself in the event that you know where it is broken. 1 An association between collar and correction can be counterproductive should wily pets decide to chew on each other's collars (obviously only in the event of having numerous pets). If this association is made, it is easily averted. Just spray each collar with Lysol, hairspray, or hot sauce as often as need be to dissuade the pets' mischievous tendencies.